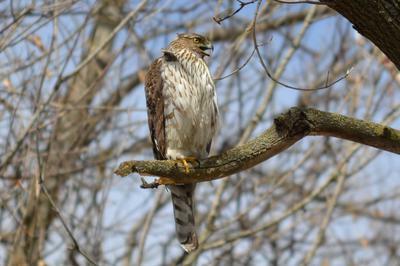 I saw this bird early afternoon in early April. It let me get quite close and take quite a few pictures before it flew off. I'm not sure what bird it is. This is most definitely not an Osprey or a falcon. 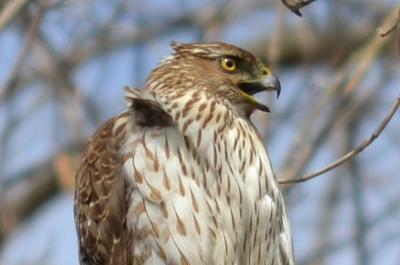 Just Google Juvenile Cooper's Hawk and you can confirm my ID. The yellow eye confirms the Juvenile, along with many other indicators. Your bird is an Osprey. 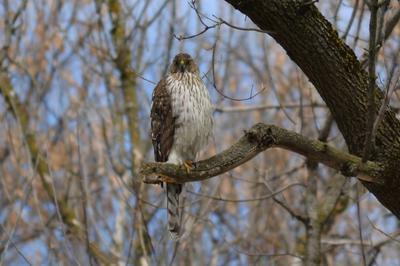 I believe that is a juvenile Cooper's Hawk. Beautiful pictures. You were lucky to be so close to it.